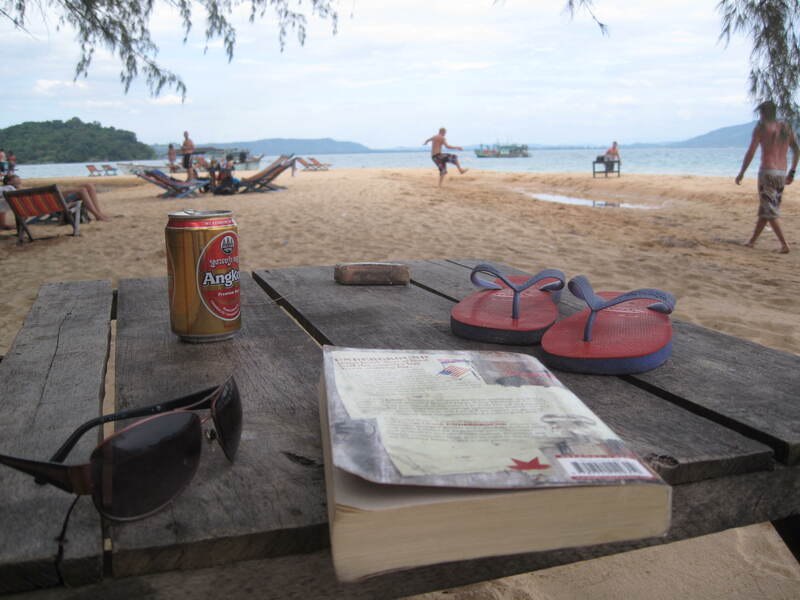 Island reading off the coast of Cambodia. Cultural savviness is something I’ve heard much about lately. It’s either a new buzzword or perhaps I just missed it while setting up League Cultural Diplomacy. It’s also variously known as cultural intelligence or intercultural competence. I like the term – if you want to work internationally or do business in foreign or new markets you need to be culturally savvy. Living in Asia I regularly meet business people who have come from many different countries to try to gain success for their respective companies in Asia. Some are culturally savvy and some aren’t – the operators who are culturally savvy succeed far more than the others. There are many ways you can ensure that you, your staff and your organisation are culturally savvy. I’ll provide some examples of how to develop cultural savviness in future blogs. Broad reading can help you to become culturally savvy. Most culturally savvy operators I’ve met also happen to be voracious readers of both fiction and non-fiction. Selecting your reading material strategically will help you to develop cultural savviness.Broad reading can help you to become culturally savvy. Most culturally savvy operators I’ve met also happen to be voracious readers of both fiction and non-fiction. Selecting your reading material strategically will help you to develop cultural savviness. Working in an international environment requires you to have a broad understanding about many things. Reading should be structured to broaden your understanding. Personally, at any given time I am reading one fiction and one non-fiction book. I recommend that your fiction reading is structured to include literature from non-western authors which will give you insights into a diverse array of cultures. Non-fiction reading might include histories, biographies of business, political or cultural leaders, political commentary or anything else that might be relevant to your particular circumstance or line of work. When I was in my twenties, like many guys, I developed a taste for twentieth century American writers like Steinbeck, Hemmingway and Kerouac. One day I looked at my bookshelf and realised nearly every book I’d ever read was by a dead white guy. Now my reading is structured to ensure I read new books, old books, classics, poetry, works from my own country (it’s amazing how many Australians haven’t a clue about Australian literature), plays, works by female writers, indigenous people, non-western writers and books that weren’t originally written in English. The structure of my reading gives me a better understanding of the world. Here’s a sample of the last ten fiction and non-fiction books I’ve read. One of the biggest challenges businesses face when operating in new or foreign markets is their own xenophobia. Culturally savvy operators aren’t xenophobic. If you want to be a culturally savvy operator working in international business you must try to purge this trait and broad reading can be an antidote. When doing business in new or foreign markets you need to put your best foot forward. Great relationships and trust are often born after common-ground is established. Imagine this; you’re an executive posted to India to try to drum up sales for your firm, you meet a prospective buyer who also loves literature, you’ve read a handful of books by Indian authors (one of which you were taught at school), you chat about these books with the buyer, you’ve found common-ground from which trust can be built, the buyer thinks you’re smart, educated and clued in, you’re off to a great start. Your reading habit has given you a competitive advantage over your competitors. I’d like to leave you today with an excellent TED Talk by Nigerian author Chimamanda Adichie about the need for people to be exposed to more than what she calls a ‘single story’ (I found this talk embedded within a similarly excellent and related article by Sunili Govinnage).When doing business in new or foreign markets you need to put your best foot forward. Great relationships and trust are often born after common-ground is established. Imagine this; you’re an executive posted to India to try to drum up sales for your firm, you meet a prospective buyer who also loves literature, you’ve read a handful of books by Indian authors (one of which you were taught at school), you chat about these books with the buyer, you’ve found common-ground from which trust can be built, the buyer thinks you’re smart, educated and clued in, you’re off to a great start. Your reading habit has given you a competitive advantage over your competitors. Oh… and let me know what you’re reading – I’d love to know. Excellent post. A few years ago, I re-read the 4 quartets (T.S.Eliot) in my opinion the best poem of the 20th century. And I understood it at a much deeper level than my 20-year-old self. So, I have been re-reading loads of stuff from earlier stages of life and just loving it. Being an “interculturalist” by profession, I tend to read a lot of Asian writers anyway, but coming back to re-examine what I thought I knew has been truly enlightening – and enjoyable! Thanks for your interesting perspectives and kind comments! I enjoyed God of Small Things but it wasn’t the most straightforward of reads – but the reward at the end makes it worthwhile. This year Bill I decided I would memorise some poetry – I’ll be writing a post on exactly why I’ve decided to do this and how I think it will help my business career in a later post! You can join also join the discussion about this post on LinkedIn!